The cursor is always black and white. The marker takes on the color of the current layer. If you are in a situation where the cursor is moving away from a specified point, such as when using elevator mode, a tracking line will appear. 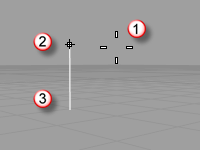 Cursor (1), marker (2), tracking line (3). If an object snap is on, the marker will snap to the snap point.